The new 5” KRK ROKIT RP5 Generation 4 (“G4”) bi-amp professional monitor takes music and sound creativity to a whole new industry-level. DSP-driven room tuning with 25 visual Graphic EQ settings on an LCD, combined with the included KRK App help minimize and correct problems in your acoustic environment. Matching drivers made with Kevlar ensures the same sonic integrity on every single frequency, minimizes listening-fatigue, and offers an incredibly balanced listening experience. Highest-grade Matching Woofer and Tweeter made with Kevlar: A matching driver design ensures the same sonic integrity on every single frequency and minimizes listening-fatigue, while offering an incredibly balanced listening experience. 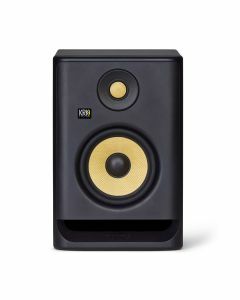 Following the technology and legacy of the unrivaled KRK Expose E8, the new ROKIT G4 series proprietary drivers feature a superbly rigid and high tensile strength-to-weight ratio material known for high-end sound reproduction.